It is an axiom of the real estate business here in Santa Fe, New Mexico that the priciest residences are mud houses on dirt roads. Like most such maxims this one is only partially true. 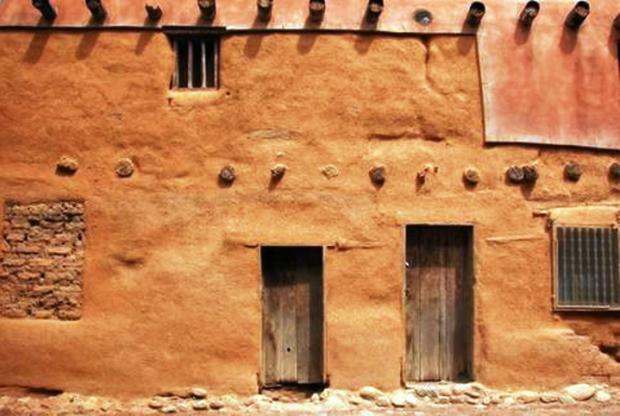 These houses are not really made of mud – but rather a mixture of clay, sand, straw, and sweat known as adobe. I learned this the other day at El Rancho de las Golondrinas, the living history museum at which Marsha and I volunteer. She works principally in the 18th century Golondrinas Placita where she sometimes guides visitors through its several rooms and buildings, but mainly is in the weaving section of that Placita where she has enough different things to do to keep her active mind and hands happily busy. On this day Marsha was demonstrating weaving on a piece she is making for herself with the intent of later decorating it with colcha, a Spanish form of embroidery. I have been assigned to El Grande Molino (the big water wheel powered grist mill) and Sierra Village, the late 1800s representation of the New Mexico lifestyle in the mountains. This time however, while Marsha was weaving, I was assigned to the adobe brick making area to give hands on lessons to children and adults on how these quintessential New Mexican building blocks were manufactured. I went into this “job” not knowing much more about adobe than the aforementioned real estate rule of thumb. But as the day went on, as frequently happens, I learned several things that I did not know about “mud houses.” – which I later supplemented with some internet searches. For example adobe, like most ancient inventions, is not made according to a formula but rather by feel. The ratio of clay to sand in the adobe that we were making was about 80% clay and 20% sand. But in clays with more natural “grit” in them, the proportion of sand would be lower. The purpose of the straw is similar to that of rebar in modern concrete construction – to increase the tensile strength (resistance to being torn apart) of the structure. The volume of straw is, in general, the maximum amount that can be added and still be able to mix the adobe. And water is the minimum amount that allows the clay, sand and straw to be combined. The sweat quotient is a function of the amounts of straw and water, as well as the temperature and amount of sun beating down of the workers. Fortunately for my two fellow brick makers and me, the shade of a tree knocked down the heat by about fifteen degrees and made our five-plus hour workday more bearable. The word adobe /əˈdoʊbiː/ itself has been around for about 4000 years with basically no change in either pronunciation or meaning. It comes from the Middle Egyptian word ɟbt "mudbrick" (c. 2000 BC). The word remained the same as Middle Egyptian evolved into Late Egyptian, Demotic or "pre-Coptic", and finally to Coptic (c. 600 BC). It was then absorbed into Arabic (aṭ-ṭūbu) and assimilated into the Old Spanish language as adobe [aˈdobe], probably in the Muslim-controlled areas of the Iberian Peninsula, known as Al-Andalus. English borrowed the word from Spanish in the early 18th century. So, when the Spanish came to New Mexico in the 1500s they brought with them the technology to make adobe bricks and houses. However that engineering knowledge already existed among the Pueblo Indians who resided in the area for a least a half century before. The particulars, or nitty-gritty if you will, of the Native American engineering technique was however slightly different from that of the Conquistadors. The bricks that the Spanish used were rectangular and were made in wooden molds similar to the demo models that our trio of adobe masons was using – but larger. The building blocks of the Pueblo Indians were handmade in the shape and size of softballs. Both types of “bricks” were however held together with a mortar made of the same mixture, minus the straw – and then painted over with a slightly more liquid layer of straw-less adobe. Ultimately the Puebloans adopted the Spanish style – in this case, unlike Catholicism, recognizing the practicality and efficiency of the technique rather than being coerced into converting. However one aspect of the Indian architecture particularly caught the interest of the Spaniards. Taos Pueblo, whose buildings have been in existence in situ for over 1,000 years –allowing for the occasional reapplication of the outer coat of adobe – used its local clay as the basic element of its adobe. This earth, known now as micaceous clay, contains a high proportion of mica. Mica is a great natural conductor of heat and as a result, allows the Taos Pueblo cookware to hold heat extremely well. It also glitters brightly in the intense northern New Mexican sun. Brightly enough to be mistaken for a more precious metal by Spanish explorers who had trudged thousands of miles in the desert heat in search of the Seven Gold Cities of Cibola – allegedly first rumored to exist in the area by Estebanico, the “Black Muslim from Azamoor,” who was the guide for Álvar Núñez Cabeza de Vaca and his 600 hundred Conquistadors on their search for yellow metal in 1527 CE. Something that the Spanish apparently did find in the Pueblos is what has become the New Mexican way of putting a roof onto an adobe house. Like the rest of the building, the upper covering was made of adobe (or sometimes mud), supported by a wooden substructure made up of “vigas” and “latillas”. Vigas – peeled logs with a minimum of woodworking – are the main structural members carrying the weight of the roof to the load-bearing exterior walls. The exposed beam ends projecting from the outside of the wall are often replicated in modern Pueblo style, non-adobe architecture. The vigas in turn support latillas – hewn boards, or in earlier buildings, simply peeled branches – which are placed crosswise and upon which the adobe roof is laid, normally with intermediate layers of brush or soil. 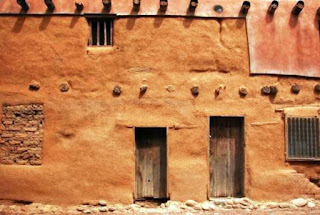 This technique dates back to the Ancestral Puebloan peoples – and vigas (or holes left by deteriorated vigas) are still visible in some surviving buildings. “Barrio Analco” was initially settled by the Tlaxcalan Indians who arrived from Mexico with the first Spanish settlers under the leadership of Juan de Onate in 1598. “Analco” means “across the water” in the language of the Tiaxcalans, who chose to build their neighborhood on higher ground just above the Santa Fe River. Tree-rings (probably taken from the vigas) date the house to about 1650, but the building is believed to have been constructed on the ruins of earlier Pueblo settlements that could date back to the 1200s AD. The mission of El Rancho de las Golindrinas living history museum is to offer visitors an in-depth look into the celebrations, music, dance and many other aspects of life in the Spanish, Mexican and Territorial periods of the Southwest. As such, several of the buildings are reconstructed examples of adobe structures that played a part in 18th and 19th century New Mexican history. On this day my part in this was to involve visitors in creating small one bite brownie-size adobe bricks using the traditional methods. 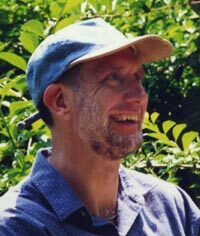 “W” – who has several years experience in this – was in charge of our group, which consisted of “A”, a teenage girl who along with her mother and sister volunteer at el Rancho, and myself. By the time I arrived W had set up a wheelbarrow with the adobe ingredients and a large shovel – and was laying out the wooden molds we would use to create the bricks, twenty in each template. After introductions I began mixing the slurry while W tended to some administrative matters. “A” and I then alternated blending the semi-liquid mixture until it was proclaimed ready – when made into a ball it stuck together and did not adhere to our hands. That’s as scientific as it gets. For the next five hours, we and our visitors created almost one thousand baby building blocks. The mini-adobes will be used in early September at the Fiesta de los Niños to provide a hands-on opportunity to actually construct some small-scale adobe buildings. Just like the Tiaxcalan tykes and the children at Taos Pueblo did in the days before plastic Legos.